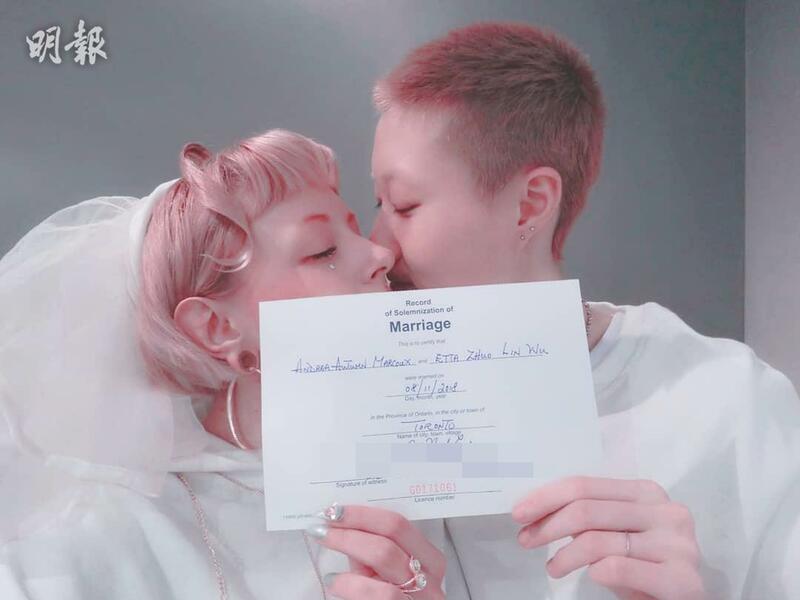 Jackie Chan’s 19-year-old daughter Etta Ng Chok Lam confirmed on Monday morning that she had married her 31-year-old Canadian internet celebrity girlfriend Andi Autumn. Ng posted a photo on her Instagram account of the happy couple, both wearing white dresses and holding a marriage certificate dated November 8, 2018. Under the photo, Ng wrote, “united by love and law, on our wedding day”. “We have all been hurt but if you can dream of love, you can find it. Love is kind, it does not judge. Love is both strength and weakness. Love can make [a] change. Love wins!” she wrote. Many internet users expressed their blessings on Instagram as well as Weibo, China’s Twitter-like service. Ng is Jackie Chan’s daughter with actress and former beauty queen Elaine Ng Yi Lei, who announced her pregnancy and disclosed her affair with Chan in 1999, although the pair did not marry. Ng and Autumn started dating in 2017 and moved to Canada in October that year, but their relationship failed to win support from her parents. In April, Ng asked for help from the public in a YouTube video that went viral. In the video Ng said she and Autumn were on the verge of homelessness, and blamed her “homophobic” parents. At that time, Ng’s claims were denounced by her mother Elaine Ng. “I feel that if they have no money, they should go find work. They shouldn’t film a clip telling others they are broke and who Etta’s father is. People all over the world work hard and don’t rely on someone else’s fame to get money,” Elaine Ng was quoted as saying by website Coconuts. Wow I didn't know jackie's daughter was this young and her partner is much older. Anyway all the best to them both. Wish the both a life long of happiness and well being. Hopefully, their family will eventually accept them. This seem like a immature love to me but I maybe wrong, anyway all the best to them.